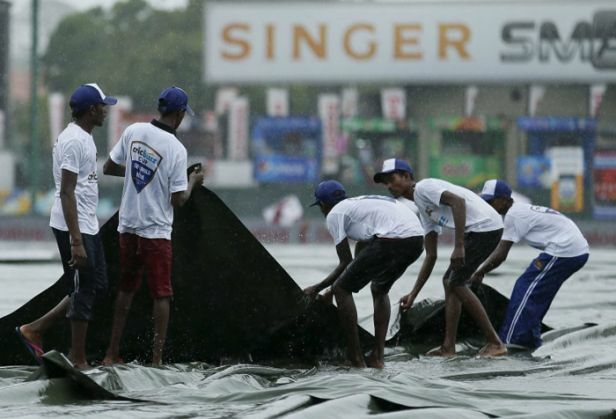 Rain played spoilsport on the opening day, washing out more than two sessions, after India were reduced to a precarious 50 for two in their first innings on the opening day of the third and final cricket Test against Sri Lanka in Colombo on 28 August. Persistent rain prevented any play after the first hour at the SSC, where heavens opened up shortly in the morning session. The visitors had faced a mere 15 overs when weathergods destroyed any chances of play post lunch. Cheteshwar Pujara (19) and skipper Virat Kohli (14) were the unbeaten batsmen for India when play was called off after a couple of inspections on a soggy ground, which had puddles owing to the showers. For the remaining four days, weather-permitting, play will start at 9.45 am and go on till 5.15 pm to make up the overs lost. Earlier, Sri Lanka won the toss and elected to field first on a recently re-laid pitch with a sprinkling of grass. The hosts made three changes to their side, with Upul Tharanga coming in for the retired Kumar Sangakkara. Fit-again Nuwan Pradeep returned in place of Dushmantha Chameera while Jehan Mubarak was dropped and Kusal Perera handed his Test debut. India, on the other hand, made two changes to the playing eleven, with Pujara coming in for the injured Murali Vijay, and Naman Ojha handed his Test debut after Wriddhiman Saha's hamstring injury. Pujara walked out to open the innings with KL Rahul (2). It was India's fifth different opening combination in the last six Tests. And their partnership didn't last long, with Rahul bowled off the second ball he faced. Dhammika Prasad (1-16) bowled an inswinger that jagged back massively and the young opener was squared completely, unable to come forward or go backward to cover the line possibly. Ajinkya Rahane (8) walked out to bat at number three, and started off with a couple of crispy drives down the ground. But his stay didn't last long either, as he was struck in front of the leg-stump by Nuwan Pradeep (1-16) in the 4th over, out plumb LBW. With both centurions from the second Test back in the pavilion, India were struggling at 14/2, as Kohli walked to the crease. He began confidently, but he was lucky to be still batting when the rain-break came. In the eighth over he was dropped off Pradeep by Perera who is keeping instead of Dinesh Chandimal. It was a thick inside edge that carried to the keeper who spilled a regulation chance to his left, and then the ball went on to hit the helmet behind him, thus garnering five penalty runs as well. Kohli was on 8 then. Later, Prasad went off the field with a sore back. Angelo Mathews (0-7) then came on to bowl a few overs as India were placed at 40/2 after the first hour's play. Rangana Herath (0-6) also bowled an over, before rain came down in a hurry and held up proceedings. The series stands at 1-1, after Sri Lanka had won the first Test in Galle by 63 runs. India then scored a comeback 248-run win in the second Test at P Sara Oval.